"Our next landing will be our battle ground and we shall fight. We shall fight to the death!" The episode title appropriateness meter says we should hope to be terrified this episode! The Tardis has materialised in an old dark house. 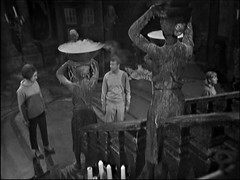 The Doctor & Ian explore upstairs, while Vicki & Barbara examine the huge carved face fireplace whose eyes light up scaring them. Ian sees apparitions while Doctor finds a laboratory with SOMETHING on the table. As they approach it sits up and they realise that they're in the lair of Frankenstein's Monster. 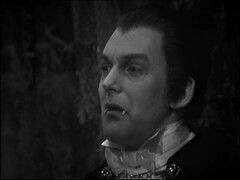 Meanwhile Vicki & Barbara encounter a dinner suited gentleman with long canines who introduces himself as Count Dracula before vanishing as does Vicki. A screaming woman comes onto the balcony as Barbara falls through a section of wall. Ian & the Doctor think there's something familiar about the house, it's what they'd expect in a Nightmare. The Doctor wonders if they've wandered into the realm of dreams. 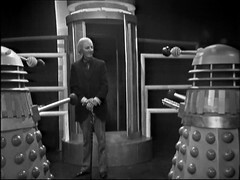 The Daleks arrive as Ian & The Doctor search for Barbara & Vicki. 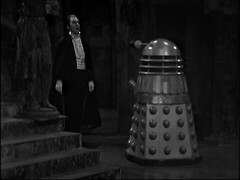 A Dalek encounters Frankenstein's Monster which attacks it, while another is distracted by Dracula. Vicki shouts a warning and is separated from the others who've not noticed she is gone and dematerialise. 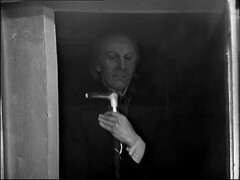 The monster destroys a Dalek allowing Vicki to hide in the Dalek's time machine. 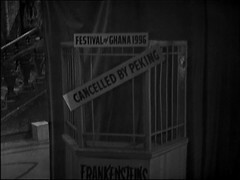 The Tardis crew speculate on where they'd been as the camera pulls back revealing they've been in a House of Horrors at the futuristic Festival of Ghana. Barbara notices Vicki has gone. The Daleks observe the Tardis is nearing the planet Mechanus. The Daleks use their reproducer program to begin to make a double of the Doctor. Vicki tries to contact the Tardis for help and manages to find the double. The Doctor is blaming himself for Vicki being left behind. Ian suggests capturing the functional Dalek time machine and returning to find Vicki. The next time they land they will stop and fight the Daleks. 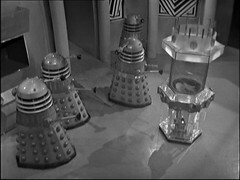 The Daleks meanwhile activate their robot Doctor as the Tardis amaterialises in swampy terrain that Ian thinks looks alive. The double is sent to infiltrate and kill the Tardis crew. I remarked about the Scooby Doo element to Keys of Marinus episode 3. Well Terry Nation's done it again by providing us with a near perfect Scooby Doo like setting by materialising the Tardis in the typical Scooby Doo haunted house. Creaking, cobwebs, thunder & lightening and even the regular cast splitting up and each encountering something nasty - the works. Roiks! 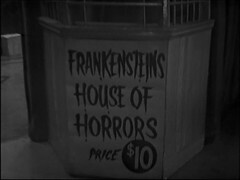 Of course what that really gives us is Dracula & Frankenstein's monster vs the Daleks! Then after 15 minutes, including the a proposed theory that we may be in a land of dreams (not as silly as it sounds as we find out later!) we discover that this location is nothing but a disused funhouse, set in the futuristic year of 1996! BARBARA: I'm not wild about this place. IAN: I don't know. Ideal place to fight Daleks, you know. Good stout walls, an upper storey, stairs. Daleks don't like stairs. We refer you to the Dalek on the upper deck of the ship last week! Ian, of course, didn't get to see that. He could be in for a shock later. 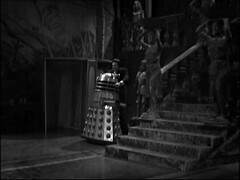 Sadly there's more Dalek silliness in this episode starting off with an on screen mistake: As The Doctor and Ian descend into Frankenstein's Laboratory, before the Daleks' ship arrive what do we glimpse through the archway at the base of the stairs? A Dalek waiting for it's moment in the next scene! Er, er, in earth time, er, four minutes. The vaguely apologetic hesitancy makes him sound a bit like Blake's 7 Slave! As I remarked last episode The Chase & the aforementioned Keys of Marinus have certain similarities: If you change the travel bands of Keys of Marinus to time machines here as the means of transport and add in a pursuing force, something that Marinus lacked, and they're not dissimilar. An early sign of Nation's recycling policy, perhaps noticing as I did that having the Vrood appearing occasionally as pursuers of the Tardis crew in the earlier story would have added something. For more recycling see also: Most other Nation written Dalek stories. 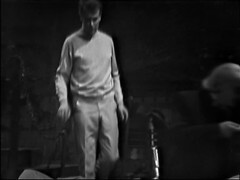 In fact The Chase is strongly rehashed in later episodes of the Dalek Masterplan that throughout continues Terry Nations frequent trick of changing the setting as often as possible. 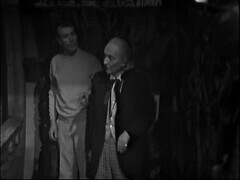 This episode is the first appearance of a double of the Doctor. Unfortunately for most of this episode it's transparently obvious he's a double due to it being played by another actor who looks nothing like William Hartnell! Thankfully Hartnell himself dubs the robot double's main speech and a brief on screen close up of Hartnell with a Dalek at the end helps the illusion. But the damage is done. Playing the robot Doctor is Edmund Warwick. 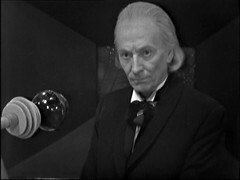 He'd previously been Darrius in The Screaming Jungle, the fourth episode of The Keys of Marinus and then obtained his main qualification for this role by doubling for William Hartnell in The End of Tomorrow, the fourth episode of The Dalek Invasion Of Earth, while Hartnell was resting following an on set injury the previous week. 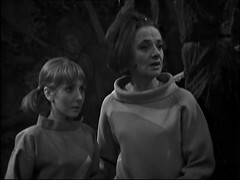 The screaming woman in this episode, credited as The Grey Lady, but what is probably meant to be a banshee is a return appearance by Roslyn DeWinter who choreographed the Web Planet and appeared as the Menoptera Vrestin in the same story. 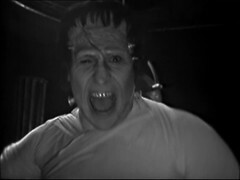 John Maxim is credited as Frankenstein (it's Frankenstein's Monster - Frankenstein is the scientist who creates it!). He'll be back in The Moonbase as a Cyberman where he's credited as John Wills.